For the oil and gas industry, gathering and curating well data is either labor intensive or really expensive. 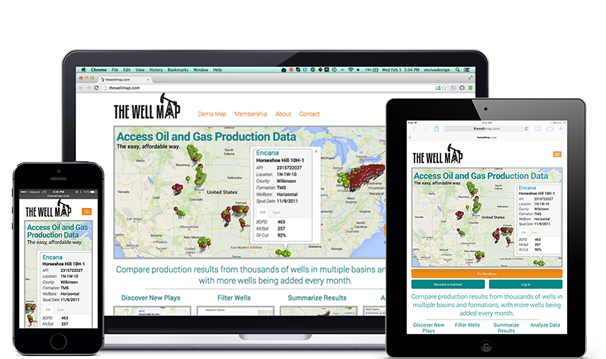 The Well Map aim’s to make this easier and more affordable. While Breahna designed and developed the custom WordPress front-end, Karl developed the form filtering functionality and mapping the data points on the map. This site is mostly intended for desktop usage, but with mobile usage on the constant rise, we knew we needed to make it available and easy-to-use on all screen sizes. That’s why we designed and built it to work on mobile devices as well as desktops. On the home page, to make it easy for the user, there needed to be large buttons that appeared only on mobile. You can see those buttons in the iPad example above.